"Dad, I don't wanna practice violin today!" "Dad, I'm not gonna practice violin today!" There are times that you hear a student say that, and you can tell that if something doesn't change there is going to be a knock-down drag-out fight. And frankly, nobody wins then. How can we handle this situation? 1. Pause. Backing off isn't backing down. Take a two minute pause with something productive. Perhaps a bow game or a favorite tune. Back off and do something more effective. 2. Be sympathetic about competing issues. Life is complicated, even for young students. It may not be a sign of defiance, just something else going on right now. A scheduling conflict (But I won't be able to play with Katie after practice, she has a softball game), other issues (My teacher says I need to have three books read by the end of the week) or some other concern (Dexter says only nerds play violin) can dramatically change a student's attitude toward practice. Listen and respond appropriately. 3. Be clear with expectations. Tell the student what you expect done and why you want that done at the same time. It helps them understand why the task is important and may change their attitude. "Mortimer, we need to get work on that piece every day for 5 minutes. Every time you do that you get a little bit better. Once we get really good at it your teacher may let you move on to Book 3! Just think how proud Mrs. Snurdley will be when she tells you that!" 4. Make your expectations age- and stage-appropriate. A 12-year-old can be expected to remember to practice for 30 minutes, but a 6-year-old can't focus for that long. 5. Be clear with consequences. Consequences need to be appropriate and make sense to the task at hand. 6. Here's one I need to work on. Stay calm. If you get angry, your child will focus on your anger, rather than on the task. A quiet voice and redirection almost always work better than sarcasm, threats, and guilt-trips. If you find yourself getting upset, review Point 1. Finally, catch your student being good -- often. Express your approval. A child will catch those good words and turn his attitude on a dime, if the words ring true. So don't just spit compliments out. Watch for the good points (They really ARE there. ), and let your student know that you appreciate them. Here's a great practice reminder. Put this magnet on your refrigerator. Each morning turn it so the little fella is frowning. 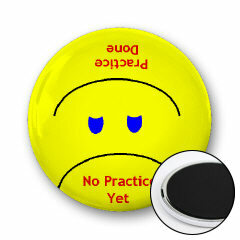 "No Practice Yet" When you have practiced, turn him over. (Move your mouse over the picture to see what happens.) "Practice Done!" Great as a gift for ANY musician you know! Click here to check out this GREAT LITTLE MOTIVATIONAL TOOL! 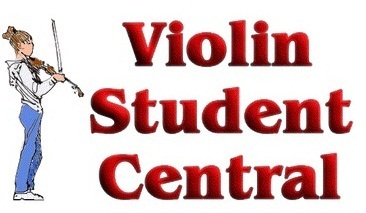 Strings is a REALLY GOOD resource for Violinists (Fiddlers Included), Violists, Cellists and Bassists. If it's got strings and you play it with a bow, these folks cover it! Fingers never Far From the Fiddle . . . even while you're at the computer! 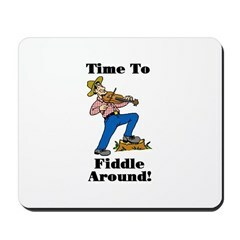 Get this Time to Fiddle Around! Mouse Pad for your fiddlin' friends. Make the Instrument fun and practice problems go WAY DOWN! An electric violin may be just the thing! If you student is serious about music...consider it. Lots of fun and VERY, VERY COOL! 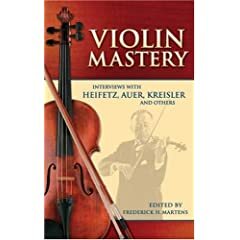 And here are some resources that you may want to read, listen to, and practice to turn playing violin from a chore to a joy!